UCSB has a MathWorks Matlab TAH (Total Academic Headcount) license. This license is available to all UCSB Faculty, Staff, and Students. Visitors or visiting researchers may access the software in a number of labs or on their hosting department's UC-owned computers. Only UCSB employes and students may download Matlab to their personal computers. Please go to the UCSB MathWorks page to download the software. Then, if you haven't logged in before, create a new MathWorks account using your UCSB Email (you will need to create a passwrod for the account), to gain access to a Matlab license. If you have any questions, please contact COSL. Matlab License Annual renewals are coordinated by COSL. Please contact COSL. 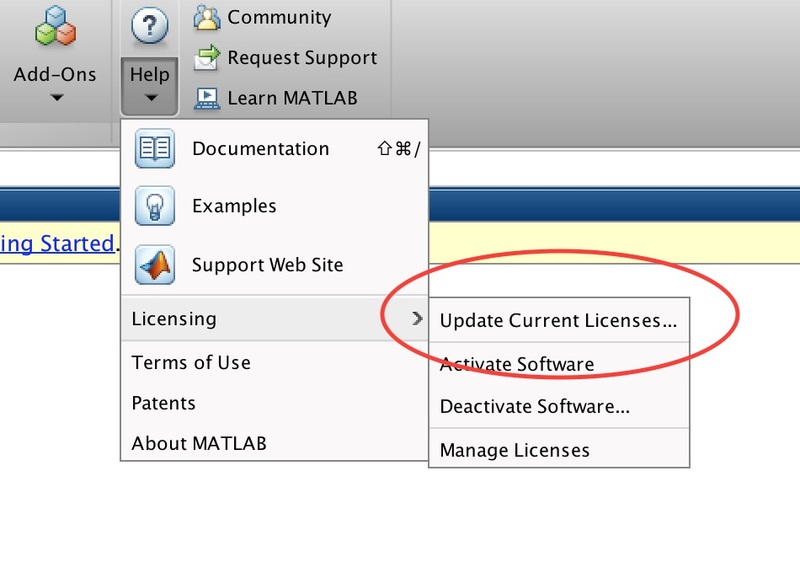 Open the MATLAB program, then Help->Licensing->Update Current License. If you don’t update before your license expires, then you will need to use the Activation Key to update your license. If the license file has expired, existing MATLAB users simply need to launch MATLAB and it will start the Activation Client. Once in the activation client, users are provided with a guided workflow to re-activate the license. On your Mac go to: /Applications/MATLAB_R2016b.app/Activate.app/Contents/MacOS/Activate, to active the new license online. You may need to adjust the path to the matlab version you use. MacOS Sierra, released on September 20, 2016, introduced a compatibility issue with MATLAB. The issue is related to Language & Region preferences, and it may result in file corruption. Determine if your Language & Region combination requires a patch. On October 6th, MathWorks applied a patch to MATLAB and MATLAB Runtime in the downloadable version of R2016b for Mac. No patch is required if you downloaded R2016b after October 6th. Information on supported platform changes. R2015b will be the last release of the 32-bit version of MATLAB for Windows. MathWorks releases subsequent to R2015b will not be available for the 32-bit Windows operating system. To use releases after R2015b, impacted users are advised to migrate to 64-bit Windows at this time. They can continue to use releases up through R2015b. MathWorks technical support engineers will continue to provide support for those releases on 32-bit Windows. See the platform road map for the latest information on planned platform changes to MathWorks products. Connect to “denali.pstat.ucsb.edu” via SSH. Refer to Connecting to cluster page, and to run it: type “matlab”.